I admit I was in love with their site even before I was approached to do a review for Krsna Mehta's Fabulous Venture India Circus. Inspired By India with a contemporary Krsna Mehta Twist is how I see India Circus. Home Decor, personal accessories to fashion apparel, India Circus has it all. When my India Circus package arrived for review..my excitement knew no bounds. Many of my blogger friends had reviewed their products and were all praises for them. So I decided to add it to my owl collection. The Mug is of a really good quality. I love the fact how the inside of the mug is colored pink. Loved the colors and detailing. I was on a lookout for a wallet for the longest time. And when I saw this wallet, it was love at first sight. Compact, handy yet spacious with a burst of colors. What's not to like in it? This bag takes me to Goa. The crazy yet Indian colors and motifs make it even more interesting with the added glamor of silver straps. But the thing that makes it a "Winner" is its size. This bag can accommodate all your belongings, and for girls like me who like to carry their world with them, its is nothing but a boon. You can stuff your cosmetics, water bottle, umbrellas, glares and still have space left. The packaging is impeccable. I have never seen such proficiency in packaging elsewhere. The quality of the goods at India Circus is outstanding. Even the minutest details are taken care of and that too in style. With the kind of service and quality you get, the pricing is perfect. The website is user friendly and is so stylishly designed. All in all...I loved India Circus and wouldn't mind shopping here again and again. 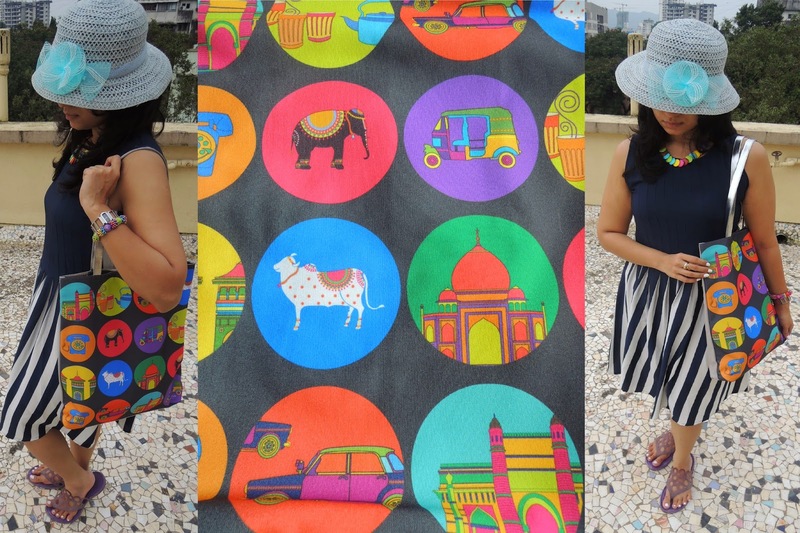 Have you shopped from India Circus yet? Tip: If you like something on their site, order it now, because their stuff goes out of stock in a jiffy. I love the presentation of this post. All your picks are fabulous and I have an owl fetish too, so totally going to check out that mug. I love both the outfits too, very stylish. I am also keen n waiting for my stuff to arrive from them . Finally got ur comment too . Loved everything about this post...cup & wallet stole the magic for me. I love your owl collection!! !